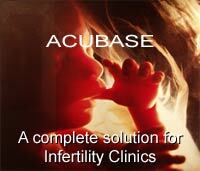 Welcome to ACUBase, the complete integrated solution to the management of infertility clinics and assisted conception units. It is the product of years of intensive cooperation between one of the leading software companies and a group of medical specialists in assisted conception. Firstly, the success of any assisted conception clinic depends on the harmonious integration of various groups and departments within the clinic. ACUBase is designed to help each and every group: Clinicians, Embryologists, Administrators, and Nurses; each will find that ACUBase can make his or her job easier and more efficient. Secondly, while infertility treatment itself is controlled by the disciplines of science, the final success of the clinic relies heavily on the personal experience and the individual approach of each practitioner. ACUBase with its unlimited customisation is designed to accommodate and integrate the wealth of different experiences and approaches and yet allow for a reporting output that is fully compliant with HFEA. This website will give you a better insight into our unique solution, ACUBase. To date (11th of November, 2008), there are now thirteen major sites using ACUBase. Legal Notice | All rights reserved worldwide.